Although cricket was introduced to India by European merchant sailors in the 18th century, and the first cricket club was established in Calcutta (currently known as Kolkata) in 1792, India's national cricket team did not play its first Test match until 25 June 1932 at Lord's, becoming the sixth team to be granted Test cricket status. In its first fifty years of international cricket, India was one of the weaker teams, winning only 35 of the first 196 Test matches it played. From 1932 India had to wait until 1952, almost 20 years for its first Test victory. The team, however, gained strength in the 1970s with the emergence of players such as batsmen Sunil Gavaskar and Gundappa Viswanath, all-rounder Kapil Dev and the Indian spin quartet of Erapalli Prasanna, Srinivas Venkataraghavan, Bhagwat Chandrasekhar and Bishen Singh Bedi. Traditionally much stronger at home than abroad, the Indian team has improved its overseas form, especially in limited-overs cricket, since the start of the 21st century, winning Test matches in Australia, England and South Africa. It has won the Cricket World Cup twice – in 1983 under the captaincy of Kapil Dev and in 2011 under the captaincy of Mahendra Singh Dhoni. After winning the 2011 World Cup, India became only the third team after West Indies and Australia to have won the World Cup more than once, and the first cricket team to win the World Cup at home. It also won the 2007 ICC World Twenty20 and 2013 ICC Champions Trophy, under the captaincy of MS Dhoni. It was also the joint champions of 2002 ICC Champions Trophy, along with Sri Lanka. As of 19 October 2018[update], India is ranked first in Tests, second in ODIs and second in T20Is by the ICC. Virat Kohli is the current captain of the team across all formats, while the head coach is Ravi Shastri. The Indian cricket team has rivalries with other Test-playing nations, most notably with Pakistan, the political arch-rival of India. However, in recent times, rivalries with nations like Australia, South Africa and England have also gained prominence. Kumar Shri Ranjitsinhji Jadeja was an Indian who played for the English cricket team. The British brought cricket to India in the early 1700s, with the first cricket match played in 1721. In 1848, the Parsi community in Bombay formed the Oriental Cricket Club, the first cricket club to be established by Indians. After slow beginnings, the Europeans eventually invited the Parsis to play a match in 1877. By 1912, the Parsis, Sikhs, Hindus and Muslims of Bombay played a quadrangular tournament with the Europeans every year. In the early 1900s, some Indians went on to play for the England cricket team. Some of these, such as Ranjitsinhji and KS Duleepsinhji were greatly appreciated by the British and their names went on to be used for the Ranji Trophy and Duleep Trophy – two major first-class tournaments in India. In 1911, an Indian team went on their first official tour of the British Isles, but only played English county teams and not the England cricket team. India was invited to The Imperial Cricket Council in 1926, and made their debut as a Test playing nation in England in 1932, led by CK Nayudu, who was considered as the best Indian batsman at the time. The one-off Test match between the two sides was played at Lord's in London. The team was not strong in their batting at this point and went on to lose by 158 runs. India hosted its first Test series in the year 1933. England was the visiting team that played 2 Tests in Bombay (now Mumbai) and Calcutta (now Kolkata). The visitors won the series 2-0. The Indian team continued to improve throughout the 1930s and '40s but did not achieve an international victory during this period. In the early 1940s, India didn't play any Test cricket due to the Second World War. The team's first series as an independent country was in late 1947 against Sir Donald Bradman's Invincibles (a name given to the Australia national cricket team of that time). It was also the first Test series India played which was not against England. Australia won the five-match series 4–0, with Bradman tormenting the Indian bowling in his final Australian summer. India subsequently played their first Test series at home not against England against the West Indies in 1948. West Indies won the 5-Test series 1–0. India recorded their first Test victory, in their 24th match, against England at Madras in 1952. Later in the same year, they won their first Test series, which was against Pakistan. They continued their improvement throughout the early 1950s with a series win against New Zealand in 1956. However, they did not win again in the remainder of the decade and lost badly to strong Australian and English sides. On 24 August 1959, India lost by an innings in the Test to complete the only 5–0 whitewash ever inflicted by England. The next decade saw India's reputation develop as a team with a strong record at home. They won their first Test series against England at home in 1961–62 and also won a home series against New Zealand. They managed to draw home series against Pakistan and Australia and another series against England. In this same period, India also won its first series outside the subcontinent, against New Zealand in 1967–68. Panoramic view of the Eden Gardens Stadium during IPL 2008. The key to India's bowling in the 1970s were the Indian spin quartet – Bishen Bedi, E.A.S. Prasanna, BS Chandrasekhar and Srinivas Venkataraghavan. This period also saw the emergence of two of India's best ever batsmen, Sunil Gavaskar and Gundappa Viswanath. Indian pitches have had the tendency to support spin and the spin quartet exploited this to create collapses in opposing batting line-ups. These players were responsible for the back-to-back series wins in 1971 in the West Indies and in England, under the captaincy of Ajit Wadekar. Gavaskar scored 774 runs in the West Indian series while Dilip Sardesai's 112 played a big part in their one Test win. A graph showing India's Test match results against all Test match teams from 1932 to September 2006. The advent of One Day International (ODI) cricket in 1971 created a new dimension in the cricket world. However, India was not considered strong in ODIs at this point and batsmen such as the captain Gavaskar were known for their defensive approach to batting. India began as a weak team in ODIs and did not qualify for the second round in the first two editions of the Cricket World Cup. Gavaskar infamously blocked his way to 36 not out off 174 balls against England in the first World Cup in 1975, India scored just 132 for 3 and lost by 202 runs. In contrast, India fielded a strong team in Test matches and was particularly strong at home, where their combination of stylish batsmen and beguiling spinners were at their best. India set a then Test record in the third Test against the West Indies at Port-of-Spain in 1976, when they chased 403 to win, thanks to 112 from Viswanath. This West Indian defeat is considered to be a watershed in the history of their cricket because it led to captain Clive Lloyd dispensing with spin altogether and relying entirely on a four-man pace attack instead. In November 1976, the team established another record by scoring 524 for 9 declared against New Zealand at Kanpur without any individual batsman scoring a century. There were six fifties, the highest being 70 by Mohinder Amarnath. This innings was only the eighth instance in Test cricket where all eleven batsmen reached double figures. During the 1980s, India developed a more attack-minded batting line-up with stroke makers such as the wristy Mohammed Azharuddin, Dilip Vengsarkar and all-rounders Kapil Dev and Ravi Shastri. India won the Cricket World Cup in 1983, defeating the favourites and the two-time defending champions West Indies in the final at Lords, owing to a strong bowling performance. In spite of this, the team performed poorly in the Test arena, including 28 consecutive Test matches without a victory. In 1984, India won the Asia Cup and in 1985, won the World Championship of Cricket in Australia. Apart from this, India remained a weak team outside the Indian subcontinent. India's Test series victory in 1986 against England remained the last Test series win by India outside the subcontinent for the next 19 years. The 1980s saw Gavaskar and Kapil Dev (India's best all-rounder to date) at the pinnacle of their careers. Gavaskar made a Test record 34 centuries as he became the first man to reach the 10,000 run mark. Kapil Dev later became the highest wicket-taker in Test cricket with 434 wickets. The period was also marked by an unstable leadership, with Gavaskar and Kapil exchanging the captaincy several times. With 619 wickets, Anil Kumble is the world's third highest wicket-taker in Tests and India's highest Test and ODI wicket-taker. The addition of Sachin Tendulkar and Anil Kumble to the national side in 1989 and 1990 further improved the team. The following year, Javagal Srinath, India's fastest bowler since Amar Singh made his debut. Despite this, during the 1990s, India did not win any of its 33 Tests outside the subcontinent while it won 17 out of its 30 Tests at home. After being eliminated by neighbours Sri Lanka on home soil at the 1996 Cricket World Cup semifinal, the team underwent a year of change as Sourav Ganguly and Rahul Dravid, later to become captains of the team, made their debut in the same Test at Lord's. Tendulkar replaced Azharuddin as captain in late 1996, but after a personal and team form slump, Tendulkar relinquished the captaincy and Azharuddin was reinstated at the beginning of 1998. With the captaincy burden removed, Tendulkar was the world's leading run-scorer in both Tests and ODIs, as India enjoyed a home Test series win over Australia, the best-ranked team in the world. After failing to reach the semifinals at the 1999 Cricket World Cup, Tendulkar was again made captain, and had another poor run, losing 3–0 on a tour of Australia and then 2–0 at home to South Africa. Tendulkar resigned, vowing never to captain the team again. Ganguly was appointed the new captain and the team was further damaged in 2000 when former captain Azharuddin and fellow batsman Ajay Jadeja were implicated in a match-fixing scandal and given life and five years bans respectively. This period was described by the BBC as "the Indian cricket's worst hour". However, the new core – Tendulkar, Dravid, Kumble and Ganguly – swore not to let this happen to them again, and lead Indian cricket out of the dark times. And the first three put aside personal ambitions to let Ganguly lead them into a new era. Since 2000, the Indian team underwent major improvements under the captaincy of Sourav Ganguly and guidance of John Wright, India's first ever foreign coach. India maintained their unbeaten home record against Australia in Test series after defeating them in 2001. The series was famous for the Kolkata Test match, in which India became only the third team in the history of Test cricket to win a Test match after following on. Australian captain Steve Waugh labelled India as the "Final Frontier" as a result of his side's inability to win a Test series in India. Victory in 2001 against the Australians marked the beginning of a dream run for India under their captain Ganguly, winning Test matches in Zimbabwe, Sri Lanka, West Indies and England. The England series is also known for India's highest ODI run-chase of 325 runs at Lord's which came in the Natwest ODI Series final against England. In the same year, India were joint-winners of the ICC Champions Trophy with Sri Lanka and then went to the 2003 Cricket World Cup in South Africa where they reached the final, only to be beaten by Australia. The 2003–04 season also saw India play out a Test series in Australia where they drew 1–1 with the world champions, and then win a Test and ODI series in Pakistan. The Indian cricket team in action at Wankhede Stadium. At the end of the 2004 season, India suffered from lack of form and fitness from its older players. A defeat in a following home Test series against Australia was followed by an ODI home series defeat against Pakistan followed by a Test series levelled 1–1. Greg Chappell took over from John Wright as the coach of the Indian cricket team following the series, and his methods proved to be controversial during the beginning of his tenure. The tension resulted in a fallout between Chappell and Ganguly, resulting in Rahul Dravid being made captain. This triggered a revival in the team's fortunes, following the emergence of players like Mahendra Singh Dhoni, Suresh Raina, and the coming of age of players like Irfan Pathan and Yuvraj Singh. A thumping home series victory over Sri Lanka in 2005 and a drawn series with South Africa put India at second place in the ICC ODI rankings. Dravid, Tendulkar and Virender Sehwag were selected to play for the ICC World XI in the 2005 "SuperTest" against Australia. A convincing ODI series win in Pakistan in early 2006, following a loss in the Test series, gave India the world record of 17 successive ODI victories while batting second. Towards the middle of 2006, however, a 4–1 series loss in the West Indies gave rise to a slump in India's ODI form, while they achieved a 1–0 victory in the Test series that followed, giving them their first Test series victory in the Caribbean since 1971. India's ODI form slumped further with a disappointing performance in the 2006 Champions Trophy and a drubbing in the ODI series in South Africa. This was followed yet again by an initial good performance in the Tests, giving India its first Test match win in South Africa, although they went on to lose the series 2–1. This Test series was marked by Ganguly's comeback to the Indian team. In December 2006, India played and won its first ever Twenty20 international in South Africa, becoming the most recent Test team to play Twenty20 cricket. The beginning of 2007 had seen a revival in the Indian team's ODI fortunes before the 2007 Cricket World Cup. Series victories against the West Indies and Sri Lanka, marked by the comeback of Ganguly, and strong form by Tendulkar, and the emergence of young players like Robin Uthappa saw many pundits to tip India as a real contender to win the 2007 Cricket World Cup. However, defeats to Bangladesh and Sri Lanka saw India fail to reach the second round. After winning the Test series against England in August 2007, Dravid stepped down as the captain of the team, following which Dhoni was made the captain of the Twenty20 and ODI team. In September 2007, India won the first-ever Twenty20 World Cup held in South Africa, beating Pakistan by 5 runs in the final. In 2007–08, they toured Australia where India lost the highly controversial home Test series 2–1 but managed to win the CB series the following month with a whitewash final of Australia. In April 2009, India secured their first Test series win in New Zealand in 41 years. After beating Sri Lanka 2–0 in December 2009, India became the No. 1 Test team in the world. They retained the ranking by drawing series against South Africa and Sri Lanka. In October 2010, India whitewashed Australia 2–0 in the home test series, giving them back-to-back series wins against them. Later that year, India managed to draw the Test series in South Africa at 1–1. On 2 April 2011, India won the 2011 Cricket World Cup by defeating Sri Lanka in the final, thus becoming the third team after West Indies and Australia to win the World Cup twice, the previous win being in 1983. Gautam Gambhir and the skipper Dhoni led the way with 97 and 91* respectively. India also became the first team to win the World Cup on home soil. India were whitewashed 4–0 in away Test series by England in August 2011 due to which England replaced India as the No. 1 Test team in the rankings. This series was followed by another 4–0 whitewash of India in January 2012 in Australia. The disastrous whitewashes saw the retirement of Dravid and VVS Laxman from Test cricket in 2012. Tendulkar retired in November 2013 after his 200th Test match. With Ganguly having retired in 2008, this period signalled the end of the fabled middle-order batting line-up India had for a decade. 2012 signalled a rough period for Indian cricket as they were beaten 2–1 by England at home in the Test series. This was the first Team India were beaten by England at home in the modern era. This was followed by a 2–1 loss in the ODI series against Pakistan, India's arch-rivals, at home. India was then knocked out in the second round of the 2012 ICC World Twenty20. India also failed to qualify for the 2012 Asia Cup final which closed out a disappointing 2012 for the Indian cricket team. 2013 saw a resurgence in Indian cricket. In early 2013, India returned the favour to Australia and whitewashed them 4–0 at home in a Test series. India then beat the Aussies 3–2 in the 7-match ODI series and won the one-off T20I. However, India lost heavily against New Zealand and South Africa away from home and led to heavy criticism of Indian cricketers for not being able to perform overseas. India defeated England in the 2013 ICC Champions Trophy final and Mahendra Singh Dhoni became the first captain in history to win the three major ICC trophies, namely- ICC Cricket World Cup, ICC World Twenty20 and ICC Champions Trophy. This was followed by a victory in the West Indies Triangular Series in 2013 consisting of India, West Indies and Sri Lanka. In 2014, India toured Bangladesh and England. Although they beat the former 2–0 in 3 One Day Internationals, Team India were beaten 3–1 in 5 Test matches by England. This series included a famous win for the Indian team in the first match of the series at Lord's. The Test series was followed by a 3–1 win for the Indians in a 5-match ODI series and a loss in a one-off T20, both against England. India failed to reach the final of the Asia Cup yet again in 2014. In the 2014 ICC World Twenty20 hosted in Bangladesh, India narrowly missed out on another ICC trophy by losing to Sri Lanka in the final. This tournament saw the rise of Virat Kohli as one of the best limited overs batsmen in world cricket, as he was adjudged the man of the series. India soon comprehensively beat Sri Lanka and West Indies in ODI series to cement their position at the top of the ODI rankings. India toured Australia towards the end of 2014 for a 4-match Test series, which is remembered for MS Dhoni's sudden retirement from Test cricket after the end of the second Test. Virat Kohli was appointed as the captain of Team India in Test matches but he was unable to turn the series around and India lost 2–0. Kohli's first series win as captain came away from home in a 3-match Test series vs Sri Lanka, which signalled the beginning of an unbeaten Test series run for India. 2015 saw the beginning of India's dominance at home in Test matches under new captain Virat Kohli when they comprehensively beat South Africa. This series was the beginning of an unbeaten streak of 19 Test matches for India which was brought to an end by Australia in early 2017. This series also saw the emergence of Ravichandran Ashwin and Ravindra Jadeja as two of the best spinners and all-rounders. They spun webs around touring batsmen, much like the spinning quartet of the 1970s. This was followed by limited overs victories over Australia and Sri Lanka away from home. India was knocked out of the 2015 World Cup in the semi-final stage, to eventual winners Australia. India began 2016 by winning the 2016 Asia Cup, remaining unbeaten throughout the tournament, beating Pakistan along the way. India were favourites to win the 2016 ICC World Twenty20 which was being held at home, but they lost in the semi-final to eventual champions West Indies. Virat Kohli was again named the man of the series. In 2016, "The Grand Home Season" began for India, including series at home against New Zealand, England, Bangladesh and Australia. India whitewashed New Zealand to regain the number one ranking in Test cricket after almost 10 years. Before the series against England in November 2016, MS Dhoni resigned as captain of India in limited overs, thus handing the captaincy to Virat Kohli across all formats. India beat England across all three formats, with a notable 4–0 win in the Test series. This was followed by Test series wins against Bangladesh and Australia, which meant India reclaimed the Border Gavaskar Trophy. Ravichandran Ashwin became the fastest cricketer of all time to reach 250 wickets; he and Ravindra Jadeja occupied the top two spots in both the ICC Bowlers and All-Rounders rankings at the time. In the process, India became the third team (after South Africa and Australia) to have won their most recent Test series against all the other Test-playing nations. India holds an unbeaten streak of 8 consecutive Test series wins as of 19 August 2017[update]. India defeated Pakistan in their first game of the 2017 ICC Champions Trophy, winning by a convincing 124-run margin, but lost their second game of the group against Sri Lanka by 7 wickets despite posting a total of 321. In their final group game against South Africa, a must-win encounter, India won comfortably and sealed a spot in the semi-finals, against Bangladesh. India comfortably won the match by 9 wickets, and faced arch-rivals Pakistan in the final, the first time they had met at this stage of a tournament since 2007. In an anti-climax, considering India were the clear favourites, Pakistan defeated India comfortably by 180 runs in the final, outclassing them across all three departments. India beat the West Indies 3–1 in a 5-match ODI series in the Caribbean in July 2017, but lost to the same opposition in a one-off T20I. India then toured Sri Lanka, and comprehensively defeated them 3-0 in a three-match Test series, the first time India had whitewashed a team away from home in a Test series with at least three games. The next year saw mixed results in Tests for India: they lost away series in both South Africa and England, but won their away series against Australia, the first time they had won a series there. In home Tests, they defeated West Indies. They won the ODI leg of the South African tour, followed by the tri-series with Sri Lanka and Bangladesh. They lost 2–1 in the ODI series in England, followed by a win at home to West Indies and away to both Australia and New Zealand. At the start of 2019, Australia won a T20I series 2–0, representing Virat Kohli's first home defeat in a T20I series. The Board of Control for Cricket in India (BCCI) is the governing body for the Indian cricket team and first-class cricket in India. The Board has been operating since 1929 and represents India at the International Cricket Council. It is amongst the richest sporting organisations in the world. It sold media rights for India's matches from 2006–2010 for US$612,000,000. It manages the Indian team's sponsorships, its future tours and team selection. The International Cricket Council determines India's upcoming matches through its future tours program. However, the BCCI, with its influential financial position in the cricketing world, has often challenged the ICC's program and called for more series between India, Australia and England which are more likely to earn more revenue as opposed to tours with Bangladesh or Zimbabwe. In the past, the BCCI has also come into conflict with the ICC regarding sponsorships and the legitimacy of the ICC Champions Trophy. The current chairman of the selection committee is M. S. K. Prasad. Devang Gandhi, Sarandeep Singh, Jatin Paranjpe, and Gagan Khoda are the other members of the selection committee from 21 September 2016. Cricket whites have been traditionally used by the team when playing first-class cricket. In addition to their whites, Indian fielders wear a dark blue cap or a white wide-brimmed sun hat, with the BCCI logo in the center. Helmets are also dark blue. Some players sport the Indian flag on their helmet. The branding is minimal for whites; the BCCI logo is placed on the left chest while the team sponsor's (currently OPPO) logo is present on the right chest. The kit manufacturer's (Nike) logo would be printed on the sleeve of the players' leading arms. Since colours have made their way into international cricket, the Indian cricket team has chosen blue as their primary colour. The secondary colour has changed over the years while yellow and orange have been dominant. With the inception of the World Series Cup in 1979, each team had to don a primary and secondary colour on their uniforms and the Indian team elected to wear light blue as their primary colour and yellow as their secondary colour. The team has worn different shades of blue since then. For the 1992 World Cup (Benson & Hedges World Cup), the team's colours were changed to navy-blue by ISC, the common kit manufacturer for the tournament. A light shade of blue with yellow as secondary colour and a strip with 10 different colours (representing different nations) was adapted on the uniform for the 1996 World Cup (Wills World Cup) while an even lighter shade of blue and a dominant yellow was used by ASICS, the common kit manufacturer for the 1999 World Cup. The ICC no longer appoints a common kit manufacturer for its tournaments. Different designs were adopted on the playing jerseys over the years and the most predominant one has been 'India' text written in yellow over a diagonal splash of the tricolour. Nike acquired the kit manufacturing rights for the team in 2005 and designed new jerseys for the 2007 World Cup with the lightest shade of blue used by the team till date and golden yellow as the secondary colour. A new tricolour accent was implemented on the right side of the jersey. The colour was changed to a darker feroza blue in 2009 with orange replacing yellow as the secondary colour. A new jersey was unveiled by Nike with a bolder ultramarine blue shade and a new tricolour accent placed on both sides of the jersey in 2010. A reddish-orange shade was used as the secondary colour on this uniform. In 2014, new kits were released with a slightly darker shade of blue and a minimal accent design over the shoulders. Nike released new kits once again in 2015 with a similar shade of blue and no accents. Since international teams started using different kits for T20s and ODIs, Nike released the first T20 kit for the team in 2016 with a similar shade and a contemporary design. Multiple thin strips of orange and green were included on upper right and lower left sides of the jersey respectively. A new ODI jersey was unveiled by Nike in 2017 with a similar shade of blue for the body and a darker shade of blue for the sleeves. The tricolour accent made a return to the uniform as a single thin strip on either sides of upper chest. In addition to the blue uniforms, the caps worn by the players are similar to the design of uniforms. The wide-brimmed sun hats are usually white while the helmets used by the players are of darker blue. The blue colour of the uniform has earned them the nickname of 'Men in Blue' for the Indian cricket team. Due to their love for blue colour, Nike launched the mega campaign called 'Bleed Blue' for the support of Indian team in 2011 World Cup which turned out to be a huge success and people over the internet and places adopted this to cheer for India. Similar to the first-class kits, BCCI logo is placed on the left chest while the logo of the kit manufacturer (Nike) sits on the right chest. OPPO is currently the official team sponsor and its logo is present on the central part of the jersey usually above 'INDIA' text as well as the sleeve of the players' leading arms. The sponsor's logo is also present on the back, below the players' numbers for the T20 kits only. However, for ICC tournaments, the tournament logo is printed on the right chest and the sponsor's logo is allowed only on the sleeve of the players' leading arms. The kit manufacturer's logo in such cases will be printed on the sleeve of the players' non-leading arms. The name and jersey number of the players are printed in the secondary colour (orange) at the back. The current team sponsor until 2022 is OPPO since 2017. Previously, the Indian team was sponsored by Star India from 2014 to 2017, Sahara India Pariwar from 2002 to 2013 and ITC Limited (with Wills and ITC Hotels brands) from 1993 to 2002. The current kit sponsor for the Indian team until 2020 is Nike, which in 2005 acquired the rights from BCCI. The deal with Nike has been extended twice for a period of five years each time; in 2011 and 2016 respectively. Paytm, since 2015 is currently the sponsor for all matches played by the team within India until 2019. Star Sports Network is the official broadcaster until 2023 for all matches the team plays in India. Locations of all stadiums which have hosted at least four Test matches or 10 ODIs within India. There are numerous world-renowned cricket stadiums located in India. Most grounds are under the administration of various state cricket boards as opposed to being under the control of the BCCI. The Bombay Gymkhana was the first ground in India to host a full-scale cricket match featuring an Indian cricket team. This was between the Parsis and the Europeans in 1877. The first stadium to host a Test match in India was also the Gymkhana Ground in Bombay in 1933, the only Test it ever hosted. The second and third Tests in the 1933 series were hosted at Eden Gardens and Chepauk. The Feroz Shah Kotla in Delhi was the first stadium to host a Test match after independence, a draw against the West Indies in 1948, the first of a 5-Test series. 21 stadiums in India have hosted at least one official Test match. In recent years, there has been an increase in the number of world-class cricket stadiums in India, with multiple Test venues in Indore, Chandigarh Mohali, Chennai, Mumbai, Hyderabad, Rajkot, Ranchi, Pune, Dharamshala and Nagpur. Eden Gardens in Kolkata has hosted the most Tests, and also has the second-largest seating capacity of any cricket stadium in the world, being capable of holding more than 66,000 spectators. Founded in 1864, it is one of the most historical stadiums in India, having hosted numerous historical and controversial matches. Other major stadiums in India include the Feroz Shah Kotla, which was established in 1883 and hosted memorable matches including Anil Kumble's ten wickets in an innings haul against Pakistan. For the last two years, the ground has been undergoing renovation. The Bombay Gymkhana hosted the first ever Test match in India which is the only Test it has hosted to date. Wankhede Stadium, established in 1974, has a capacity to hold 33,000 spectators and is currently the most popular venue in the city. It has hosted 24 Test matches. It was the unofficial successor of the Brabourne Stadium, which is also located in Mumbai. Mumbai is often considered the cricketing capital of India because of its fans and the talent it produces (see Mumbai cricket team) and thus the stadium regularly hosts major Test matches. The M. A. Chidambaram Stadium in Chepauk is also considered to be an important historical Indian cricket ground, established in the early 1900s it was the site of India's first Test victory. Thirty-two men have captained the Indian cricket team in at least one Test match, although only six have led the team in more than 25 matches, and six have captained the team in ODIs but not Tests. India's first captain was CK Nayudu, who led the team in four matches against England: one in England in 1932 and a series of three matches at home in 1933–34. Lala Amarnath, India's fourth captain, led the team in its first Test match after Indian independence. He also captained the side to its first Test victory and first series win, both in a three-match series at home against Pakistan in 1952–53. From 1952 until 1961–62, India had a number of captains such as Vijay Hazare, Polly Umrigar and Nari Contractor. The Nawab of Pataudi, Mansoor Ali Khan Pataudi, was the team's captain for 36 Test matches from 1961–62 to 1969–70, returning for another four matches against West Indies in 1974–75. In the early years of his captaincy tenure, the team was whitewashed in the West Indies, England and Australia. However, in 1967–68, Pataudi led India on its maiden New Zealand tour, which ended in India winning the Test series 3–1. In 1970–71, Ajit Wadekar took over the captaincy from Pataudi. Under Wadekar's captaincy, India registered its first Test series win in the West Indies and England. India played its first ODI in 1974, also under his captaincy. India won its first ODI under the captaincy of Srinivasaraghavan Venkataraghavan in the 1975 Cricket World Cup, against East Africa. Between 1975–76 and 1978–79, Bishen Singh Bedi captained the team in 22 Tests and 4 ODIs, winning 6 Tests and one ODI. Sunil Gavaskar took over as Test and ODI captain in 1978–79, leading India in 47 Test matches and 37 ODIs, winning 9 Tests and 14 ODIs. He was succeeded by Kapil Dev in the 1980s, who captained for 34 Test matches, including 4 victories. Kapil Dev led India to victory in 39 of his 74 ODIs in charge, including the 1983 Cricket World Cup. Kapil Dev also captained India's 2–0 Test series victory in England in 1986. Between 1987–88 and 1989–90, India had three captains in Dilip Vengsarkar, Ravi Shastri and Krishnamachari Srikkanth. Vengsarkar took over the captaincy from Kapil Dev after the 1987 Cricket World Cup. Although he started with two centuries in his first series as captain, his captaincy period was turbulent and he lost the job following a disastrous tour of the West Indies in early-1989 and a stand-off with the Indian cricket board (BCCI). India has had six regular Test captains since Mohammad Azharuddin took charge in 1989. Azharuddin led the team in 47 Test matches from 1989–90 to 1998–99, winning 14, and in 174 ODIs, winning 90. He was followed by Sachin Tendulkar, who captained the team in 25 Test matches and 73 ODIs in the late 1990s; Tendulkar was relatively unsuccessful as a captain, winning only 4 Test matches and 23 ODIs. He was replaced as ODI captain by Ajay Jadeja and then by Sourav Ganguly. Mahendra Singh Dhoni holds the record for most Tests wins (27) by an Indian captain. Ganguly became the regular captain of the team in both Tests and ODIs in 2000. He remained captain until 2005–06 and became the then most successful Indian captain, winning 21 of his 49 Test matches in charge and 76 of his 146 ODIs. Under his captaincy, India became the joint-winners of the 2002 ICC Champions Trophy with Sri Lanka, and the runners-up of the 2003 Cricket World Cup. India lost only three Tests at home under Ganguly and managed to draw Test series in England and Australia. Rahul Dravid took over as Test captain in 2005. In 2006, he led India to its first Test series victory in the West Indies in more than 30 years. In September 2007, Mahendra Singh Dhoni was named as the new captain of the ODI and T20I teams, after Dravid stepped down from the post. Soon after taking up the captaincy, Dhoni led the team to the inaugural World Twenty20 title. Anil Kumble was appointed Test captain in November 2007, but retired from international cricket in November 2008 after captaining in 14 Tests. Dhoni succeeded him as the Test captain, making him the captain in all formats. Under the captaincy of Dhoni, the Indian team held the number one position in the Test rankings for 21 months (from November 2009 to August 2011), and set a national record for most back-to-back ODI wins (nine straight wins). Dhoni also led the team to victory in 2011 Cricket World Cup and 2013 ICC Champions Trophy. Thus, Dhoni became the first captain in history to win all three major ICC trophies, namely- ICC Cricket World Cup in 2011, ICC World Twenty20 in 2007 and ICC Champions Trophy in 2013. He is widely regarded as India's best ever captain. However, the team performed poorly in away Tests from 2011 to 2014 and Dhoni retired from Test cricket in December 2014, with Virat Kohli being named as the new Test captain. Dhoni resigned as captain of the ODI and T20 teams in January 2017 and Kohli succeeded him at the position. Under Kohli's captaincy, India was unbeaten in 19 Test matches, starting from a 3–0 series win over New Zealand and ending with a 2–1 series win over Australia. India has an unbeaten streak of winning 9 consecutive Test series as of Dec 2017, starting with a 2–1 series win over Sri Lanka. India also became only the third team after Australia and South Africa to have won their most recent Test series simultaneously against all the other Test playing nations. As per winning percentage in Test matches, Kohli is India's most successful test captain, having won more than 61% of Test matches (at least 2 games). This lists all the players who have played for India in the past 12 months and the forms in which they have played. Correct as of 10 March 2019[update]. In March 2019, BCCI published a new contract list which will be vaild from October 2018 to Septemebr 2019. Players also receive a match fee of ₹15 lakh (US$21,000) per Test match, ₹6 lakh (US$8,300) per ODI, and ₹3 lakh (US$4,200) per T20I. †Cricket was played only at the 1998 Commonwealth Games. †The Indian team that won the 1985 World Championship of Cricket was adjudged by Wisden as the 'Team of the Century'. Sachin Tendulkar celebrates his 38th Test century during a match against Australia in 2008. Tendulkar holds multiple world records including the world's leading run-scorer and century maker in both Tests and ODIs. Sachin Tendulkar, who began playing for India as a 16-year-old in 1989 and has since become the most prolific run-scorer in the history of both Test and ODI cricket, holds a large number of national batting records. He holds the record of most appearances in both Tests and ODIs, most runs in both Tests and ODIs and most centuries in Tests and ODIs. The highest score by an Indian is the 319 scored by Virender Sehwag in Chennai. It is the second triple century in Test cricket by an Indian, the first being a 309 also made by Sehwag although against Pakistan. The team's highest ever score was a 759/7 against England at MA Chidambaram Stadium, Chennai in 2016, while its lowest was 42 against England in 1974. In ODIs, the team's highest score is 418/5 against West Indies at Indore in 2011–12. India score 413–5 in a match against Bermuda in 2007 World Cup which is the highest score ever in Cricket World Cup history. In the same match, India set a world record of the highest winning margin in an ODI match of 257 runs. India has also had some very strong bowling figures, with spin bowler Anil Kumble being a member of the elite group of 3 bowlers who have taken 600 Test wickets. 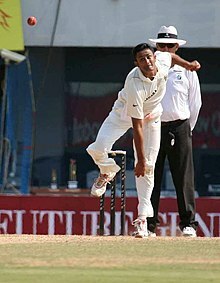 In 1999, Anil Kumble emulated Jim Laker to become the second bowler to take all ten wickets in a Test match innings when he took 10 wickets for 74 runs against Pakistan at the Feroz Shah Kotla in Delhi. Many of the Indian cricket team's records are also world records, for example Sachin Tendulkar's century tally (in Tests and ODIs) and run tally (also in both Tests and ODIs). Mahendra Singh Dhoni's 183 not out against Sri Lanka in 2005 is the world record score by a wicketkeeper in ODIs. The Indian cricket team also holds the record sequence of 17 successful run-chases in ODIs, which ended in a dramatic match against the West Indies in May 2006, which India lost by just 1 run when Yuvraj Singh was bowled by Dwayne Bravo's full toss. Sachin Tendulkar was the first batsman to score 200 runs (he was unbeaten on 200 from 147 deliveries including 25x4 and 3x6) in a single ODI innings, on 24 February 2010 against South Africa in Gwalior. On 8 December 2011, this achievement was eclipsed by compatriot Virender Sehwag, who scored 219 runs from 149 deliveries (25x4 | 7x6) versus West Indies in Indore. On 13 November 2014 the record was broken by another Indian opening batsmen, Rohit Sharma, who scored 264 runs from 173 deliveries (33x4 | 9x6) against Sri Lanka in Kolkata. In 2013, MS Dhoni became the first captain in history to win all three major ICC trophies- ICC Cricket World Cup in 2011, ICC World Twenty20 in 2007 and ICC Champions Trophy in 2013. In 2014, Virat Kohli became the first cricketer to win back-to-back man of the series awards in the 2012 ICC World Twenty20 and 2014 ICC World Twenty20. In 2017, Ravichandran Ashwin became the fastest cricketer in history to reach 250 wickets. He and Ravindra Jadeja are considered to be the best bowlers in Test cricket and occupy the top two spots in the rankings for Test bowlers as of May 2017[update]. Virat Kohli became the first captain in history to score double tons in three consecutive series, against New Zealand, England and Bangladesh in 2017. Australia at Sydney, 4th Test, January 3-7, 2019. Australia at Delhi, 5th ODI, March 13, 2019. Australia at Bengaluru, 2nd T20I, Feb 27, 2019. Players in bold text are still active with India. Supporters of the Indian cricket team wave the Indian flag during match between India and Australia at the Melbourne Cricket Ground. Sudhir Kumar Chaudhary a fan of the Indian Cricket team, travels to all Indian home games with his body painted as the Indian Flag. Due to the massive Indian diaspora in nations like Australia, England and South Africa, a large Indian fan turnout is expected whenever India plays in each of these nations. There have been a number of official fan groups that have been formed over the years, including the Swami Army or Bharat Army, the Indian equivalent of the Barmy Army, that were very active in their support when India toured Australia in 2003/2004. They are known to attribute a number of popular Indian songs to the cricket team. Fan rivalry and cross-border tension has created a strong rivalry between the Indian and the Pakistani cricket teams. In tours between these two nations, cricket visas are often employed to accommodate for the tens of thousands of fans wishing to cross the border to watch cricket. This intense fan dedication is one of the major causes of the BCCI's financial success. Often, fans engage in protests regarding players if they believe that regionalism has affected selection, or because of regional partisan support for local players. In 2005, when Sourav Ganguly was dropped from the team, Ganguly's home town Kolkata erupted in protests. India later played a match against South Africa in Kolkata, West Bengal. The Indian team was booed by the crowd who supported South Africa instead of India in response to Ganguly's dropping. Similar regional divisions in India regarding selection have also caused protests against the team, with political activists from the regional Kalinga Kamgar Sena party in Odisha disrupting the arrival of the team in Cuttack for an ODI over the lack of a local player in the team, with one activist manhandling coach Greg Chappell. Similar treatment was handed to Sunil Gavaskar in the 1987 World Cup Semi Finals by crowds at Wankhede Stadium when he got bowled by Philip DeFreitas. A successful string of results, victories against arch-rivals Pakistan or victory in major tournaments such as the World Cup are greeted with particular ecstasy from the Indian fans. Members of the Indian cricket team before a Women's Cricket World Cup game in Sydney. The Indian women's cricket team has a much lower profile than the men's team. For all national women's cricket teams, the female players are paid much less their male counterparts, and the women's teams do not receive as much popular support or recognition as the men's team. The women's teams also have a less packed schedule compared to men's teams and play fewer matches. The Indian women's cricket team played its first Test match in 1976, when they drew with the West Indies in a six-match series. The Women's Cricket World Cup was held in India in 1978 and featured 4 teams. India lost both the matches they have played. Their next appearance in the Test and ODI circuit was against Australia in 1984, in which the Test series was tied but the ODI series was lost in a whitewash. The Indian women's cricket team has since picked up their form, reaching the finals in the World Cup, but then losing to Australia. The Women's Asia Cup of 2005–06 was won by India, who beat Sri Lanka in the final. They also beat the West Indies in the 2004–05 season, winning the 5 ODI series 5–0. They were knocked out in the group stage of the 2013 Women's Cricket World Cup held in India. India reached the final of the 2017 World Cup but lost to England by 9 runs, following which the team was praised by many including Prime Minister Narendra Modi. Jhulan Goswami is the world's leading ODI wicket-taker while Mithali Raj, the captain, is the leading run-scorer in ODI cricket. ^ Sheringham, Sam (2 April 2011). "India power past Sri Lanka to Cricket World Cup triumph". BBC Sport. Retrieved 2 April 2011. ^ "Shastri, Zaheer, Dravid in India's new coaching team". ESPN cricinfo. 11 July 2017. Retrieved 11 July 2017. ^ Downing, Clement (1737). William Foster, ed. A History of the Indian Wars. London. ^ a b "Cricket and Politics in Colonial India". Ramachandra Guha. 1998. JSTOR 651075. ^ "India in British Isles, 1911". Cricket Archive. Retrieved 21 September 2006. ^ "History of the Imperial Cricket Conference". ICC. Archived from the original on 21 March 2006. Retrieved 21 September 2006. ^ "India in England, 1932". Cricinfo. Retrieved 20 September 2006. ^ "India in Australia, 1948". Cricinfo. Retrieved 20 September 2006. ^ "West Indies tour of India". Retrieved 8 July 2016. 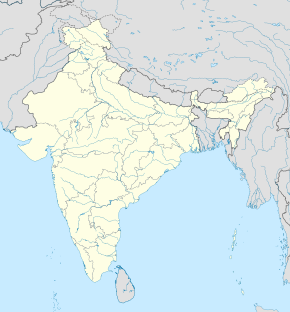 ^ "England in India, 1951–52". Cricinfo. Retrieved 20 September 2006. ^ "Beyond boundaries". Deccan Chronicle. 29 March 2011. Archived from the original on 1 April 2011. Retrieved 1 April 2011. ^ "Team India on the brink of ODI record at Vizag, remain torchbearers of 50-over format". ^ "Cricinfo- Anil Kumble". Content-usa.cricinfo.com. Retrieved 20 December 2010. ^ "India cricket: Middle-order retirements are end of era". BBC News. 23 August 2012. ^ "Steve Waugh Column". Steve Waugh. Retrieved 21 September 2006. ^ "TWI gets production rights for India-Pakistan series". The Hindu – Sport. Archived from the original on 26 November 2007. Retrieved 14 October 2006. ^ "India can find right balance before World Cup". Jamie Alter. Archived from the original on 26 November 2007. Retrieved 14 October 2006. ^ "Test results summary". Cricinfo. Retrieved 1 March 2019. ^ "ODI results summary". Cricinfo. Retrieved 1 March 2019. ^ "T20I results summary". Cricinfo. Retrieved 1 March 2019. ^ "England dethrone India to become No.1". Cricinfo. 13 August 2011. Retrieved 23 August 2011. ^ Siddharth Monga (4 June 2017). "India thrash sloppy Pakistan by 124 runs". ESPNcricinfo. Retrieved 16 June 2017. ^ Andrew Fidel Fernando (8 June 2017). "Sri Lanka complete highest successful chase in Champions Trophy history, beat India by 7 wickets". ESPNcricinfo. Retrieved 16 June 2017. ^ Siddharth Monga (11 June 2017). "Disciplined India run dysfunctional South Africa out". ESPNcricinfo. Retrieved 16 June 2017. ^ Siddharth Monga (15 June 2017). "Dominant India march into yet another final". ESPNcricinfo. Retrieved 16 June 2017. ^ Andrew Fidel Fernando (18 June 2017). "India hoodoo broken emphatically by Pakistan". ESPNcricinfo. ^ Siddharth Monga (6 July 2017). "Kohli, spinners seal 3–1 series win". ESPNcricinfo. Retrieved 7 July 2017. ^ Sidharth Monga (9 July 2017). "Lewis century powers Windies to 9-wicket win". ESPNcricinfo. Retrieved 20 July 2017. ^ Andrew Fernando (13 August 2017). "Ashwin, Shami lead India in 3-day rout, to complete whitewash". ESPNcricinfo. Retrieved 19 August 2017. ^ "Nimbus Bags Cricket Rights for $612 m". The Hindu. India. Archived from the original on 10 January 2007. Retrieved 11 January 2007. ^ "ICC faces threat from India". Cricinfo. Retrieved 11 January 2007. ^ "India challenge ICC". TVNZ. Retrieved 11 January 2007. ^ "Selection Policy not Zonal: Pawar". The Tribune. India. Retrieved 11 January 2007. ^ "Team India's new jersey unveiled". The Times of India. 18 February 2009. ^ "Team India dazzles in 'ultramarine' blue new jersey". The Times of India. 20 October 2010. ^ "Team India gets new Nike ODI kit". Cricbuzz. Retrieved 29 November 2018. ^ "Nike Cricket Presents India National Team Kit". Nike News. Retrieved 29 November 2018. ^ India, Press Trust of (15 January 2015). "Team India's new jersey for ICC Cricket World Cup 2015 is made out of recycled plastic bottles!". India.com. Retrieved 29 November 2018. ^ "Team India Unveils T20 National Team Kit". Nike News. Retrieved 29 November 2018. ^ "Nike launches new India ODI kit before England series - Times of India". The Times of India. Retrieved 29 November 2018. ^ "Bleed Blue". Nike Cricket. ^ "OPPO wins Indian team sponsorship rights till 2022". EspnCricinfo. ^ "Star wins Indian team sponsorship rights". EspnCricinfo. ^ "Nike wins Indian cricket team endorsement rights, 199 crore brand sponsorship deal with India cricket team and BCCI". Digi-help.com. Archived from the original on 6 April 2011. Retrieved 20 December 2010. ^ "Nike to remain sponsor of Team India kit - Times of India". The Times of India. Retrieved 29 November 2018. ^ "Players, BCCI unhappy with kit sponsor Nike". The Indian Express. 22 August 2017. Retrieved 29 November 2018. ^ "Paytm strikes title sponsorship deal with BCCI till 2019 for Rs 203.28 crore - Firstpost". www.firstpost.com. Retrieved 29 November 2018. ^ "Star Sports India bags BCCI media rights for Rs 6138.1 crore - Times of India". The Times of India. Retrieved 29 November 2018. ^ "Cricinfo – Grounds: Eden Gardens". Cricinfo. Retrieved 21 September 2006. ^ "Cricinfo – Grounds: Feroz Shah Kotla". Cricinfo. Retrieved 21 September 2006. ^ "Cricinfo – Grounds: Wankhede Stadium". Cricinfo. Retrieved 21 September 2006. ^ "Cricinfo – Grounds: M.A. Chidambaram Stadium". Cricinfo. Retrieved 21 September 2006. ^ "Eden Gardens Test matches". cricinfo.com. Retrieved 10 October 2016. ^ "Feroz Shah Kotla Test matches". cricinfo.com. Retrieved 10 October 2016. ^ "M. A. Chidambaram Stadium Test matches". cricinfo.com. Retrieved 10 October 2016. ^ "Wankhede Stadium Test matches". cricinfo.com. Retrieved 10 October 2016. ^ "M. Chinnaswamy Stadium Test matches". cricinfo.com. Retrieved 10 October 2016. ^ "Green Park Test matches". cricinfo.com. Retrieved 10 October 2016. ^ "Brabourne Stadium Test matches". cricinfo.com. Retrieved 10 October 2016. ^ "Punjab Cricket Association I. S. Bindra Stadium Test matches". cricinfo.com. Retrieved 10 October 2016. ^ "Sardar Patel Stadium Test matches". cricinfo.com. Retrieved 10 October 2016. ^ "Vidarbha Cricket Association Stadium, Jamtha Test matches". cricinfo.com. Retrieved 10 October 2016. ^ "Rajiv Gandhi International Stadium Test matches". cricinfo.com. Retrieved 2 March 2019. ^ "Barabati Stadium Test matches". cricinfo.com. Retrieved 10 October 2016. ^ "Saurashtra Cricket Association Stadium Test matches". cricinfo.com. Retrieved 13 November 2016. ^ "Holkar Stadium Test matches". cricinfo.com. Retrieved 10 October 2016. ^ "Dr. Y.S. Rajasekhara Reddy ACA-VDCA Cricket Stadium Test matches". cricinfo.com. Retrieved 21 November 2016. ^ "Maharashtra Cricket Association Stadium Test matches". cricinfo.com. Retrieved 7 March 2017. ^ "JSCA International Stadium Complex Test matches". cricinfo.com. Retrieved 20 March 2017. ^ "Himachal Pradesh Cricket Association Stadium Test matches". cricinfo.com. Retrieved 28 March 2017. ^ "Sawai Mansingh Stadium Test matches". cricinfo.com. Retrieved 10 October 2016. ^ "Greater Noida Stadium matches". ^ "Dehradun cricket Stadium matches". ^ "Greenfield Intl Stadium matches". ^ "Nehru Stadium Test matches". cricinfo.com. Retrieved 10 October 2016. ^ "Vidarbha C. A. Ground Test matches". cricinfo.com. Retrieved 10 October 2016. ^ "Lal Bahadur Shastri Stadium Test matches". cricinfo.com. Retrieved 10 October 2016. ^ "Gymkhana Ground Test matches". cricinfo.com. Retrieved 10 October 2016. ^ "Gandhi Stadium Test matches". cricinfo.com. Retrieved 10 October 2016. ^ "K. D. Singh Babu Stadium Test matches". cricinfo.com. Retrieved 10 October 2016. ^ "Sector 16 Stadium Test matches". cricinfo.com. Retrieved 10 October 2016. ^ "University Ground Test matches". cricinfo.com. Retrieved 10 October 2016. ^ "Neheru Stadium Guwahati matches". ^ "Neheru Stadium pune matches". ^ "Sardar Vallabhvai Patel Stadium matches". ^ "List of cricket grounds in India". ^ "Tendulkar on his captains: Ganguly was aggressive, Rahul methodical, Dhoni instinctive". Firstpost. 7 November 2014. Retrieved 1 July 2015. ^ "Replacing Sachin with Azhar as captain in 1997: When selectors spun the ball". Retrieved 8 July 2016. ^ "The Canadian Press: Sri Lanka denies India 5-0 rout by winning final ..." 13 February 2009. Archived from the original on 13 February 2009. ^ "BCCI Contracts: Pant bags Rs 5 crore category A central conttract as Dhawan, Bhuvneshwar demoted". Times of India. Retrieved 8 March 2019. .
^ Nagraj Gollapudi (8 March 2019). "Explainer - Pant on the rise, no room yet for Shaw and Agarwal". ESPNCricinfo. ^ "Jadeja, Pujara and Vijay given top BCCI contracts". Cricinfo. Retrieved 13 July 2017. ^ "Cricinfo profile: Sachin Tendulkar". Content-www.cricinfo.com. Retrieved 20 December 2010. ^ "Dravid rues faulty execution". Cricinfo Staff. Retrieved 21 September 2006. ^ "Records / India / Test matches / Result summary". ESPNcricinfo. Retrieved 30 December 2016. ^ "Records / Test matches / Team records / Results summary". ESPNcricinfo. Retrieved 30 December 2018. ^ "Cricket Records | Records | India | Test matches | Most runs". ESPN Cricinfo. Retrieved 29 October 2017. ^ "Cricket Records | Records | India | Test matches | Most wickets". ESPN Cricinfo. Retrieved 29 October 2017. ^ "Records / India / One-Day Internationals / Result summary". ESPNcricinfo. Retrieved 21 September 2018. ^ "Records / One-Day Internationals / Team records / Results summary". ESPNcricinfo. Retrieved 21 September 2018. ^ "Cricket Records | Records | India | One-Day Internationals | Most runs". ESPN Cricinfo. Retrieved 1 March 2019. ^ "Cricket Records | Records | India | One-Day Internationals | Most wickets". ESPN Cricinfo. Retrieved 29 October 2017. ^ "Records / India / Twenty20 Internationals / Result summary". ESPNcricinfo. Retrieved 11 March 2016. ^ "Records / Twenty20 Internationals / Team records / Results summary". ESPNcricinfo. Retrieved 11 March 2016. ^ "Cricket Records | Records | India | Twenty20 Internationals | Most runs". ESPN Cricinfo. Retrieved 1 March 2019. ^ "Cricket Records | Records | India | Twenty20 Internationals | Most wickets". ESPN Cricinfo. Retrieved 1 March 2019. ^ "Bharat Army History". www.bharat-army.com. Retrieved 1 July 2015. ^ "Swami Army Roars to Full Battle Cry". The Age Newspaper. Melbourne. 28 December 2003. Retrieved 21 September 2006. ^ "10,000 Visas for Pak Cricket Fans". The Tribune, Chandigarh. Retrieved 21 September 2006. ^ "Ganguly's Debt of Gratitude". BBC News. 21 March 2003. Retrieved 21 September 2006. ^ a b "I predict a riot". Andrew Miller and Martin Williamson. Retrieved 22 September 2006. ^ a b "Sachin Tendulkar booed by Wankhede Crowd". India Daily. India Daily. Retrieved 15 January 2006. ^ "Protests rock Kolkata over Ganguly's exclusion". Rediff. Retrieved 14 October 2006. ^ "Security concerns over Barabati Stadium's future". Cricinfo. 24 January 2007. Retrieved 25 January 2007. ^ "The Entire Nation Erupts with Joy". The Tribune, Chandigarh. Retrieved 20 September 2006. ^ Subhin Harika (13 June 2017). "History of Indian women' cricket team". ESPNcricinfo. Wikimedia Commons has media related to India national cricket team.